Mobilehive Web Services open its door to existing clients to participate in our referral promo. 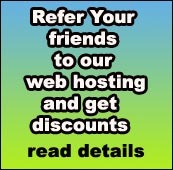 In this promo all you have to do is refer your friends who are scouting for Philippine web hosting provider to us. For every signup we will give P10 off to your monthly hosting fee as long as the account you referred stays with us. Please inform your friends to mention your domain name during signup so that we can record it and adjust your monthly fee. Referral Promo is only until April 30, 2009.